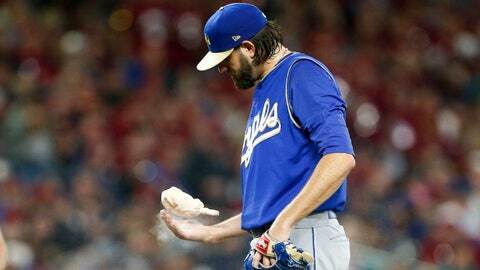 Jason Hammel allowed six runs on 13 hits over 6.0 innings in the Royals' loss to the Mariners on Saturday night. SEATTLE — Ryon Healy had four hits, including a home run, and drove in three runs to lead the Seattle Mariners to a 6-4 victory over the Kansas City Royals on Saturday night. Felix Hernandez, (8-6) gave up four consecutive hits, including a three-run homer by Mike Moustakas to start the game, but settled down to pitch 4.0 scoreless innings afterward to earn the victory and help the Mariners to a season-best sixth consecutive win. Edwin Diaz pitched a perfect ninth inning to earn his 31st save of the season. The Mariners (53-31) are 22 games over .500 for the first time since the end of the 2003 season. Jason Hammel (2-10) suffered his fifth consecutive loss, allowing all six runs on 13 hits over 6.0 innings. Moustakas gave the Royals a 3-0 in the first inning when he homered to right after Whit Merrifield and Rosell Herrera singled off Hernandez. Mitch Haniger made it 3-1 in the bottom of the inning when he doubled to the gap in left-center to score Jean Segura, who reached base on a single. The Mariners took the lead with three runs in the second. Healy homered to left-center after Denard Span singled, trying the game at 3-3. A bad decision by Alex Gordon in left field, diving for Ben Gamel‘s liner in front of him, let the ball roll to the wall for a triple with no one out. Gamel scored to make it 4-3 on a sacrifice fly to center by Mike Zunino. The Mariners added two more runs off five hits in the third inning to take a 6-3 lead. Span had an RBI double to right center after back-to-back singles by Haniger and Nelson Cruz. Healy blooped a single to center that scored Cruz from third. The Royals made it 6-4 in the seventh inning when Alberto Mondesi, who started the inning with a single, scored on a sacrifice fly by Herrera. Royals: Manager Ned Yost said RHP Ian Kennedy was feeling better Saturday after experiencing tightness on his left side when he left the game Friday after five innings. Yost didn’t day whether Kennedy would make his next scheduled start. “We will see how he feels (Sunday). If (Friday) was a 1.5 in stiffness, he is down to a half. I guess that is much better.” … INF Chester Cuthbert (lower back strain) went 0 for 2 with a walk and a run scored in his first rehab-assignment game at AAA Omaha Friday night. Cuthbert appeared in 30 games and was hitting .194 before the injury on May 16. Royals: RHP Brad Keller (2-2, 2.25) will make his sixth start of the year Sunday. Keller is coming off the best start of his rookie season, where he pitched 7.0 scoreless innings and allowed only two hits in a 2-0 victory over the Angels Monday. Mariners: LHP James Paxton (7-2, 3.65) will make his 18th start of the season Sunday. Paxton leads the team in strikeouts this season with 134 Ks in 103.2 innings. He has six double-digit strikeout games in 2018 and his 11.6 strikeouts per nine innings are the fourth-best in the AL.